This year’s Billboard Music Awards at Las Vegas’s T-Mobile Arena were a relatively low-key affair, with a handful of serviceable performances from the likes of Nicki Minaj, Lorde, and Drake, who used the location to his advantage and performed “Gyalchester” from the Bellagio fountain. But the real stars of the night were two of the industry’s stalwarts: Céline Dion, who performed “My Heart Will Go On” in honor of that song and Titanic’s 20th anniversary, and Cher, who electrified the crowd with two of her hits and received the Icon award. 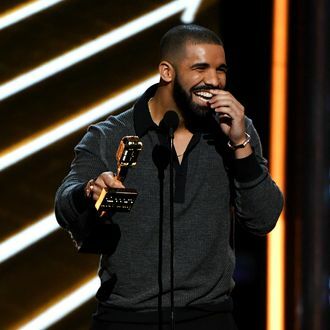 And then, of course, there were the awards: Drake broke Adele’s record for the most Billboard Music Awards in a single year with 13 awards, including Top Artist and Top Male Artist, while the Chainsmokers, Beyoncé, and Twenty-One Pilots also were some of the night’s big winners. See the full list — with winners in bold — below.